As a leading Australian distributor of horse floorings, Sherwood Enterprises QLD stocks and markets innovative designed Sherprise Eva Rubber Blend Horse Mats and the number one question we received daily is "how do I reduce horse bedding? It's expensive and rising in costs each year!" Sherprise Eva Rubber Blend Interlock Horse Mats are designed with horse comfort in mind with a significant reduction in annual costs for horse bedding like shavings or flakes that are really only to absorb urine or liquids in stable stalls, breezeways or floats. Sherprise Eva rubber blend/Eva closed cell expanded foam creates the lightness, comfort, and ideal blend for durability and performance. Improves stable hygiene, insulates against the cold or damp, reduces impact on joints/injuries, is virtually odour free, offers protection for kocks & knees, and all while bacteria cannot breed in these mats. Soft, warm and comfortable - easy DIY to install and save on bedding costs annually. The puzzled edges are water-jet cut for a tight fit and once the mats are joined they act as a single mat. Importantly, you can sterilize the mats with household disinfectant (never use bleach). 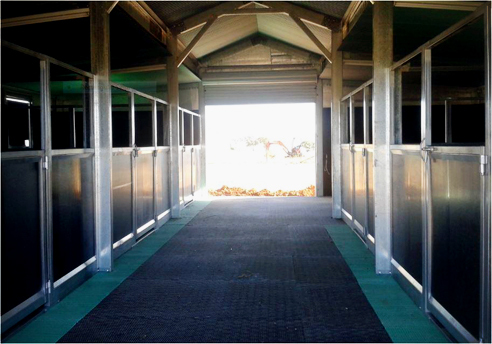 Ideal for stables stalls, breezeways/corridors, float floors and walls. Traction comfort surface mats are 1830 x 1220 x 34mm or 1830 x 1220 x 24mm thick. Contact us today as we can distribute throughout Australia. Sherwood Enterprises is proudly 100% Australian owned & operated since 2004.